The fans are waiting in anticipation for the mouth-water clash between Mumbai Indians and the Chennai Super Kings. The game will begin soon at the Wankhede Stadium in Mumbai. Chennai who has a poor record against the Mumbai Indians will look forward to changing the same. Out of eight games played between MI and CSK at the Wankhede Stadium, the visiting team has just won three. The rest were won by the home team. Ahead of CSK’s first game against the Mumbai Indians in the IPL 2019, MS Dhoni, Suresh Raina and Harbhajan Singh, clicked a picture with the groundsmen of the Wankhede Stadium. Mumbai Indians vs Chennai Super Kings Live Cricket Score. After team CSK wrapped up their practice session, the three clicked a picture with the groundsmen and the supporting staff of the stadium. Needless to say that the groundsmen were left smiling ear to ear and looked quite happy as they were all smiles for the camera. The picture was shared by the official account of Chennai Super Kings. 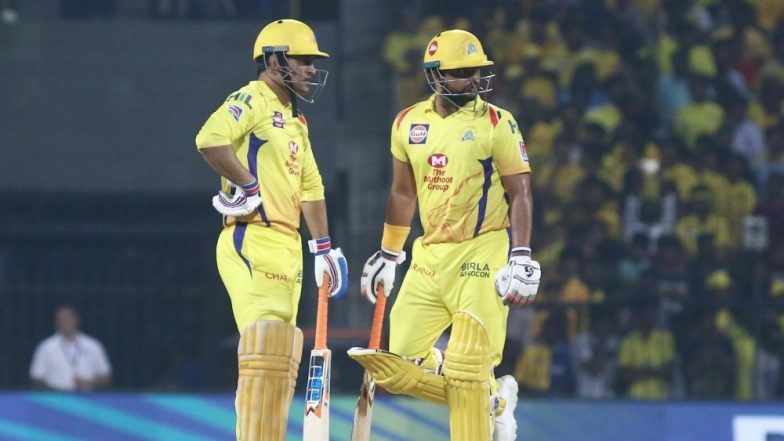 MS Dhoni Could Complete 4,000 Runs for Chennai Super Kings During the Match Against Mumbai Indians in IPL 2019. “With the sons of soil! #WhistlePodu #Yellove #MIvCSK 🦁💛,” read the caption of the snap. Talking about the game today MS Dhoni is on the verge of creating a record as he is just two runs away from getting to the 4,000 run mark for CSK. Suresh Raina and Dwayne Bravo are also about to script a unique record for CSK. While Dwayne Bravo stands just one wicket away from getting 100 wickets for the team, Suresh Raina needs one more catch to complete 100 catches for the Yellow Army.